Not too long ago, I was put in touch with a company called Taryn's Treasures, based out of Florida. After reading a bit about the products they create, namely all natural soaps, I knew I had to try them out. I love bath products, but I especially love bath products that are wholesome and natural, and so I agreed to change up my shower regimen to get the scoop on some new products. If you go to Taryn's Treasures website - tarynsbathtreasures.com, and don't see one of the products I've reviewed, just give them a holler and they can make it just for you. They're also totally open to creating a unique product for you as well, so if you have an idea you want made in to reality, shoot them an email! Make sure to check out the end of this blog post for a special Glazed Over discount code! 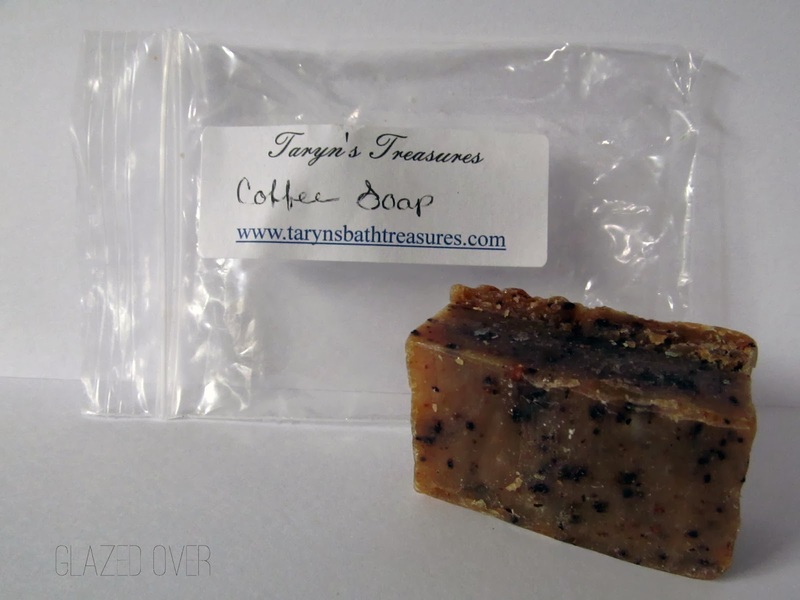 The first thing I was sent was this coffee soap. 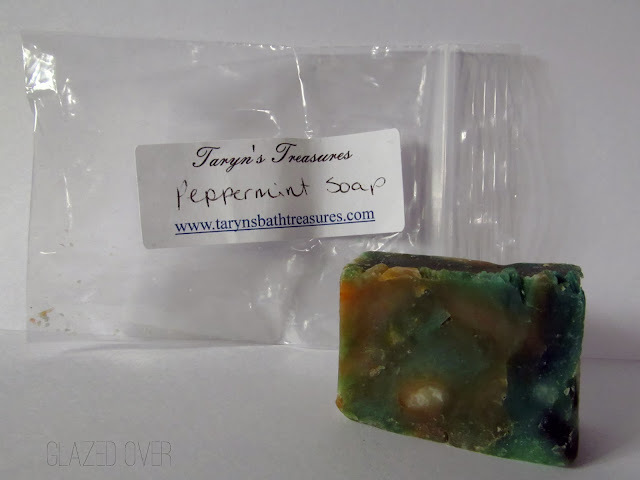 This little sample is about 1/3 the size of a typical bar sold on the Taryn's Treasures website. Full-size soap bars retail for just $4.80. I was really excited about this because I love coffee, and this has actual coffee grounds in it which are great for exfoliating skin. The first thing I noticed is that is has a faint coffee smell, it isn't too overpowering, and it certainly won't linger on the skin after your shower which some will love and others won't. Personally, I like a little smell to linger on my skin. The lowdown: I really wanted to love this soap, but it was far too exfoliating for my skin and it actually scratched up my arm, even with a light scrubbing on my body. My husband tried it out too and he had a better experience with it. I think if you're nice and careful with it, and you like a soap that will get you clean, exfoliate your skin, and won't leave any scent behind, this one's for you. The second thing I received was this peppermint soap, which is my favorite of the shower products sent to me. Again, this is just 1/3 of the size of a normal soap bar, full-size retails for $4.80. This smells lovely like peppermint, as the name suggests. Much like the coffee soap, the smell is not overpowering and the smell won't linger on your skin after a shower. The lowdown: I really enjoyed this soap, and I think those of you with normal skin will like it, too. If you have dry skin, this might not be for you as it's not moisturizing. This little sample lasted me a long time, and I would imagine the full-size samples would last you weeks! 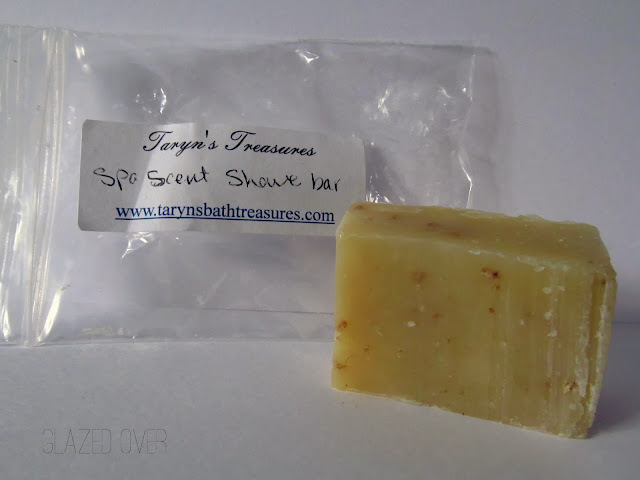 This Spa Scent Shave Bar is a gem! Again, this is just 1/3 of the size of a normal soap bar, but full-size retails for $4.80. It's made with Koalin Clay and oatmeal, and the scent is clean and refreshing. This soap suds up fast, making for a nice quick lather. You can use this as a shaving lather, or you can use it just to rinse off. The lowdown: I liked how fast the Spa Scent Shave Bar lathered up, and it felt nice on the skin. This soap was a tad more hydrating than the other two, but still best for normal skin that is not too dry already. This Juicy Sugar Scrub Cube is made with beeswax, shea butter and sunflower oil to exfoliate your skin and leave it soft. I really liked the scent of this, as it was sugary and sweet. These come in packs of 4 large cubes for $2.50. The lowdown: Unfortunately, this just wasn't a hit for me. I scrubbed it on my body and it left a white sticky film on my skin, so I had to use a body wash again to get it off, and that still didn't get everything. I was hoping this would be my new favorite body scrub, but sadly it isn't. The last product I received was this lavender peppermint body lotion. The pictured lotion is a 3 oz size, but they only sell 8 oz size which goes for $12.50. Unlike most commercial lotions, this Taryn's Treasures lotion does not contain alcohol. It is made with aloe, coconut oil, olive oil, locally obtained beeswax, the fragrance of your choice, and GSE. The lowdown: I liked this product - it wasn't my most favorite lotion, but it's a great alternative to lotions packed with chemicals. When I opened it I did notice some separation, which is normal as it's a natural product without all the preservatives and chemicals that keep things in their place in most commercial lotions. After stirring and shaking once, I haven't had a problem with separation again. This lotion does feel a bit oily on the skin, but it soaks in nicely and smells really refreshing and herbal. The scent disappears rather quickly, something I like as I don't want my lotions to clash with the perfume I wear. I would recommend this if you're interested in trying a natural lotion. All in all, I enjoyed trying these products by Taryn's Treasures. I like to switch up my cosmetics and skin care items to include natural products that don't include mystery chemicals I can't pronounce, and Taryn's Treasures offers a great alternative at a good price. And as promised, Taryn's Treasures has been nice enough to offer a special discount to all Glazed Over readers - $3 off of a $20 purchase, at tarynsbathtreasures.com. AND all purchases come with free samples! Just use code "briannarocks" at checkout! Let me know what your favorite natural products are, and certainly let me know if you've tried or plan to try anything from Taryn's Treasures!